The e-Seva centers in Mylapore have become busy spots since people started approaching them for getting certificates required for applying to the RTE (Right to Education) admissions in schools. But, since the web-servers of Tamil Nadu E-Seva portal are slow, people are facing a lot of difficulties. 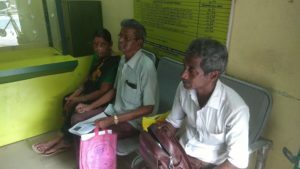 G.Koothan, a senior resident of Narayana Swamy Thotam, Mylapore arrived at the e-Seva center in Kamarajar Salai, R.A.Puram at 11 a.m. on April 23. Even after five hours, the staff at the center was not able to complete his service. He was waiting here with his wife till 4 p.m., “We want to get income certificate to avail RTE admission for our daughter. For that, we have been trying since this morning, till now we have not been able to get the service,” he says. “Usually the portal becomes slow during this time of the year since many people access the server at the same time. But this year, our server has become very slow. A service which use to take 10 minutes is now taking more than 45 minutes to be completed. And the services portal is not opening. It’s buffering all the time,” says the staff working at the e-Seva center. “We are old. We cannot stand in queues at the Taluk office. That’s why we are approaching E-Seva centers. It is very disappointing when the services take so much time here also,” says Koothan.